On the eighth day of Thul-Hijjah (Yawm-e-Tarwiyah), the pilgrim put on his Ihraam after the Salaat of Zohr & Asr and head out of Makkah to Mina. He spends the rest of the day and night in Mina involved in prayer, preparing himself to set out to Arafaat. On the nineth day of Thul-Hijjah (Yawm-e-Arafa), after praying Salaatul-Fajr in Mina, the pilgrim waits until just after sunrise, then he heads out of Mina to Plain of Arafaat which he should enter around noon. In Arafaat he Pray Zohr and Asr prayers together with one Adhaan and two Eqamahs at the commencement of Zohr time. He should then wait in Arafaat until just after sunset (approx. 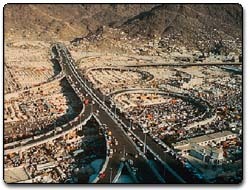 10 minutes after sunset), then set out to Mash'ar or Muzdalifa (an area between Arafaat and Mina). Postpone the maghribain prayers at Arafaat to pray them together at Mash'ar with one Adhaan and two Eqamahs, then spend the rest of the night in prayer and sleep. Also one should pick up more than required(21) pebbles for throwing at the Jamaraats in Mina. This day is known as Eidul Adha/Yawm-e-Nahr. 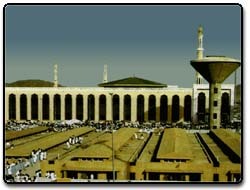 The pilgrim should pray salaatul-Fajr in Muzdalifa, then leave Muzdalifa for Mina shortly after sunrise. And heads for Jamrah Al-Aqabah then Jamrah Al-Ula and Jamara Al-Wusta for stoning. As he throws each stone at these Jamaraats he should say Allahu Akbar. On completion of the rites of stoning he should go to the place where animals are kept and slaughter an animal (Qurbani/Sacrifice-Offering). Then proceed to Taqseer or Halaq (clipping hairs or shaving the head). After that he goes to Makkah for A'maal-e-Makkah, which comprise Tawaaf of Hajj/Tawaaf Al-Zeyaarah, its prayer (Salaat Al-Tawaaf) and Sayee. 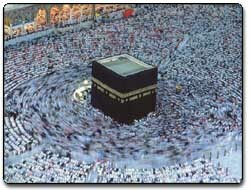 Then complete Tawaaf-Un-Nisa and its prayer and take off his Ihraam. 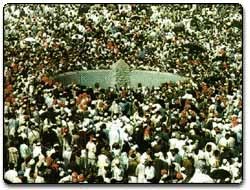 On this day a pilgrim have to perform the act of Ramy Jamaraats in Mina. 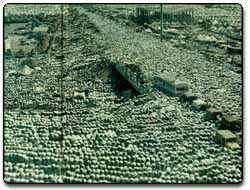 The pebbles must be thrown on the Jamaraat in their prescribed order, i.e., beginning from the one coming first from Mina towards Makkah - called Al-Jamrah Al-Ula, then the next one to it - called Al-Jamrah Al-Wusta and lastly the nearest to Makkah - called Al-Jamrah Al-Aqabah. And the pilgrim must consciously pass the night in Mina. It is not necessary to be there the whole night. He does as he did on the 11th day of Thul-Hijjah. The pebbles must be thrown on the Jamaraat in their prescribed order, i.e., beginning from the one coming first from Mina towards Makkah - called Al-Jamrah Al-Ula, then the next one to it - called Al-Jamrah Al-Wusta and lastly the nearest to Makkah - called Al-Jamrah Al-Aqabah. 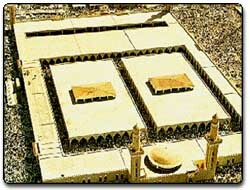 Then pilgrim can leave for Makkah immediately for Tawaaf-ul-Wida with its prayer.